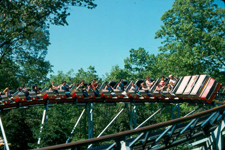 The 1976 season was one of great change at Great Adventure. 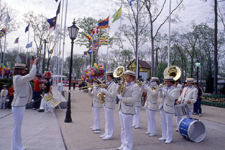 The biggest and most obvious change was the relocation of the park's entrance from the end of Dream Street to the center of the park where the Fountain became a hub. 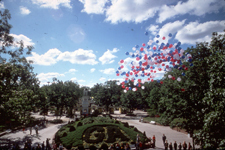 The brand new entrance was patriotically themed for America's Bicentennial celebrations taking place that year, and the new "Liberty Court" and "Avenue of the States" areas made up an impressive new entrance to the park. With the relocation of the entrance, the children's area was displaced so a new expanded children's area known as Kiddie Kingdom was added in the area that had been the old park entrance. 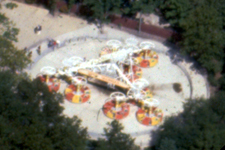 The larger children's area included new rides and structures. 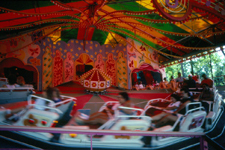 The new layout also meant a new pathway was added where the park's original Happy Feeling petting zoo was located. This new path featured a new, small powered roller coaster with the addition of the Alpen Blitz as well as a new Musik Express ride. 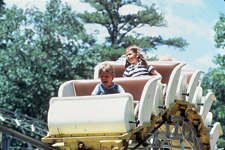 Other rides were relocated in the park to help expand the pathways and draw guests out to the edges of the park. 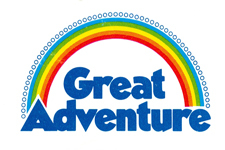 Great Adventure had hired the well known park designer Randal Duell to help improve the flow and the look of the park. 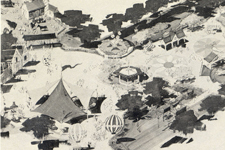 The Duell designs for the park included the new entrance plaza, Kiddie Kingdom, and the area along the lakefront between the Aqua Spectacle and the Skyride station. While all the changes were taking place in the park, behind the scenes management changes were being made as park ownership changed. Warner LeRoy's involvement with the park had more or less ended during the 1975 season, and new owners and managers tried to turn things around for the park. CARS! CARS! - 1974 CARS! CARS! EAT! EAT! - 1974 EAT! EAT!